According to polling, 71 percent of Pa. students support Obama, with 28 percent favoring Clinton. AMONG college students, Sen. Hillary Rodham Clinton could use the “Colbert bump” right about now. According to a recent Daily Pennsylvanian/CBS News poll, the junior senator from New York lags far behind Sen. Barack Obama (D-Ill.) among Penn voters on campus. Among Penn students, 73 percent of registered Democrats favor Obama for the nomination, compared to just 26 percent for Clinton – who appeared in Colbert’s show, filmed on campus, last night in an appeal to young voters before Tuesday’s primary. Penn’s numbers are also comparable to statewide data – according to the poll, which also includes data from campuses across Pennsylvania, 71 percent of students supported Obama, with 28 percent favoring Clinton. The trends revealed in the poll are not surprising for a college campus. Obama has won the youth vote in almost every state since the nominating process began in January. But the poll did reveal that whomever they support, roughly nine in 10 students are paying attention to the election, with 86 percent declaring that they are likely to vote in the primary. Similar to voters nationwide, Penn students are more concerned with the economy than anything else: 43 percent said the economy was their top issue. The war and health care tied for the second most important issue, with 17 percent each. The poll also shows that Arizona Sen. John McCain, the presumptive Republican nominee, had less support than either Democrat in addressing the issues. The poll revealed that six in 10 Penn students believe a female candidate faces more challenges than a black candidate in running for office – but the same amount said that racism, not sexism, was a greater problem in the United States. Clinton also fared poorly when students were asked who could better unite the country, with 74 percent saying Obama would do a better job. In the statewide poll, an Obama-McCain general election battle would put Obama ahead, 71 percent to 29 percent. A Clinton-McCain election, however, would see the student electorate more divided, with roughly a 60-40 split in favor of Clinton. Obama also does much better at keeping students within the Democratic party in the general election than Clinton. In a Clinton-McCain election, 19 percent of registered student Democrats said they would vote for McCain, compared to just 8 percent if Obama were the nominee. St. Joseph’s history professor and political analyst Randall Miller said Obama’s immense support among youth was attributable to the “great sense of possibility” he projects in his campaign toward students. The poll included a random sample of 2,366 undergraduates at 14 four-year colleges across Pennsylvania. It was conducted by CBS News and UWire, a national student news service that partnered with student newspapers, including the DP, for the poll. 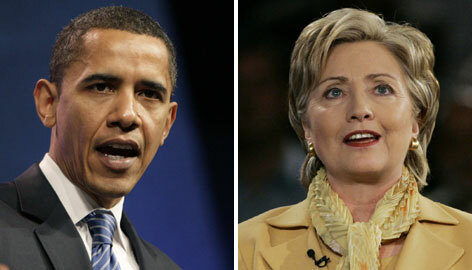 DEMOCRATIC presidential hopefuls Barack Obama (left) and Hillary Clinton, right, squared off in a debate in Pennsylvania in advance of the April 22 Democratic primary in the Keystone State. PHILADELPHIA – For a bunch of college students, they hang around with a pretty powerful crowd. There is Gov. Edward G. Rendell, who likes to show up on campus and work with the University of Pennsylvania Democrats on political events. And there is Mayor Michael Nutter, who has credited the campus political group with helping to lift him out of a crowded field of candidates in 2007. And Representative Patrick J. Murphy, who was elected in 2006 as part of the new Democratic Congressional majority after members of the group traipsed to the suburbs to knock on doors for him. But for this election the student group, known as the Penn Dems, finds itself out of synch with some of the biggest names in Pennsylvania Democratic politics. On March 5, the group, which has a list of 3,258 students, out of a student body of nearly 20,000, endorsed Senator Barack Obama in the state’s primary. Mr. Rendell and Mr. Nutter support Senator Hillary Rodham Clinton. Among the ruptured relationships that will have to be healed after a Democratic presidential nominee emerges – Mrs. Clinton’s army of fervent women, Mr. Obama’s increasingly anti-Hillary supporters – there may also be the sibling rivalry in the formerly cordial alliance of students and politicians here in the City of Brotherly Love. The Penn Dems said their endorsement of Mr. Obama reflected the wishes of the greater Penn community (although The Daily Pennsylvanian, the student newspaper, endorsed Mrs. Clinton on Thursday, which her campaign noted in an e-mail message). They said they understood that their support for Mr. Obama would “put them at odds” with Mr. Rendell and Mr. Nutter, both alumni of the university. The Penn Dems also supported Mr. Murphy, who was an underdog in his Congressional race, and knocked on 15,000 doors on his behalf. He won the election by fewer than 1,600 votes. So was he happy with the Obama endorsement? Ms. Burdette called the Obama campaign the night of the endorsement to let it know of their decision, and Mr. Obama’s Web site bragged about it the next day in a blog entry. The Penn Dems, working with UPenn for Obama, another campus group, are now throwing all their support behind their candidate, canvassing, operating phonebanks, registering voters and organizing events. The Penn campus is typically a center of political activity, but it has been buzzing during this primary campaign, with a CNN bus parked nearby and “The Colbert Report” being broadcast from there this week. The candidates and their surrogates have all paid visits, as have the stars who support them. An Obama event on campus Monday featured Kal Penn (the actor who played Kumar in “Harold & Kumar Go to White Castle” and who now teaches in the Asian American studies program at Penn) and the singer John Legend (a Penn alumnus). Ms. Bailey said the group was concerned about how Mr. Nutter would feel but had not heard anything from his office either. AGAINST THE TIDE. In the pivotal Democratic presidential primary in Pennsylvania on April 22, Senator Hillary Rodham Clinton has the endorsement of Michael A. Nutter, the new mayor of Philadelphia – a city where Senator Barack Obama is wildly popular. ← Look who’s complaining? Hillary!